Our payroll system offers many features that can cater to the special payroll processing needs of a Cleaning Service. Payroll Mate® supports many pay types and the ability to custom create your own income categories. This way, your employees can accurately be paid based on the cleaning service they provide. Cleaning services are in demand for many homes and businesses. Operating a cleaning business can be lucrative, but you may face a number of challenges including trying to administer payroll in an efficient manner. Rather than trying to handle payroll administration on your own, one option is to use a solution such as Payroll Mate®. With Payroll Mate®, cleaning businesses can take advantage of many different benefits to make payroll administration easier and more efficient. • Since Payroll Mate® is designed to work with a variety of different operating systems, you also do not have to worry about compatibility issues with whatever system you currently use in your cleaning business. • You can even use this software with MAC by making use of a virtualization technology like Parallels Desktop or Oracle Virtual Box. • While Payroll Mate® is incredibly easy to use, there is a wealth of tools available to help you including wizards and tutorials that will walk you through tasks, such as adding new employees to the system. • Friendly customer service is available through email, live chat, and by phone. • Once your employees are set up, create a print signature ready payroll checks. You can even print or email pay stubs to your staff. • Social Security and Medicare taxes are automatically calculated for you. • Additionally, Payroll Mate® will also calculate State and Federal withholdings as well as the net pay. • When you need to run a report for your cleaning business, Payroll Mate® makes it easy to do so. • Payroll Mate® will give you access to a variety of reports, such as Tax Liability, Journal Summary, Deposit Requirement, Taxes & Deductions, and Employee Earnings. • Payroll Mate® allows you to export your payroll data to accounting software applications, including Intuit QuickBooks, Peachtree Sage 50, Quicken, General Ledger. • Forms are easily ready to print, sign, and submit. • For an additional cost add-on feature to Payroll Mate®, you can even prepare 1099 MISC forms if you have independent contractors. This option also supports creating non- payroll checks. • Payroll Mate® is designed to support a variety of pay frequencies as well as pay types. Pay frequencies include: daily, weekly, bi-weekly, semi-monthly and monthly. Some pay types include hourly, salary, bonuses, and many more. • The ability to create unlimited user defined tax, income, and deduction categories makes payroll possible for any type of employee. • Do you ever find that you need to make employee notes? Payroll Mate® gives you the ability to enter employee notes so that you do not ever have to worry about forgetting anything such as a raise or hire date. • It even becomes easy to administer vacation and sick leave time for your cleaning business staff. With Payroll Mate®, you can easily track and accrue sick and vacation leave time on a per-check earned basis or a per-year earned basis. • The software will calculate the number of hours earned automatically and then print pay slips with the amount of time both earned and used. 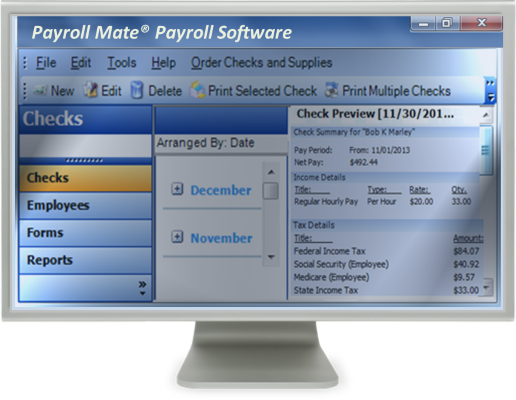 • Payroll Mate® offers a one-step backup and restore feature. Users receive a friendly reminder to back up data each time the software is closed. You can even backup data to a portable device that can be kept in a secure location. • Payroll Mate® allows users to set up a password to enter before being able to gain access to the system. You can even opt to hide or mask social security numbers on pay stubs if you would like to take advantage of greater security. As you can see, Payroll Mate® is a great solution for your cleaning service business. Whether it is setting up payroll, calculating taxes, printing reports and forms, or printing checks, Payroll Mate® has you covered.